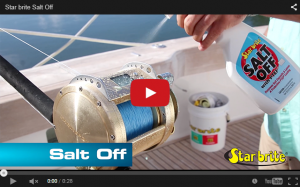 Salt Off® safely removes salt deposits from virtually all marine surfaces and fishing or dive gear. It is also the ideal way to flush and remove salt deposits from engines. The biodegradable formula contains no harsh solvents or caustic acids. It leaves a protective, non-slippery polymer coating to repel future salt deposits. To remove salt deposits from exterior marine surfaces, trailers, dive gear, fishing rods & reels: Fill dispenser cup from the Salt Off® applicator (94100) with Salt Off® Concentrate. Attach one end of applicator to a garden hose and the other end to a trigger-type watering nozzle. Ensure black knob on the applicator is in the “On” position and the blue knob is in the “Mixture” position. Thoroughly saturate all surfaces that need to be treated, allowing Salt Off® to soak in for 5 to 10 minutes. Stubborn deposits may require light brushing. Rinse with fresh water and allow treated surfaces to air dry. To treat items by immersing: Add 2 to 4 fl. oz. 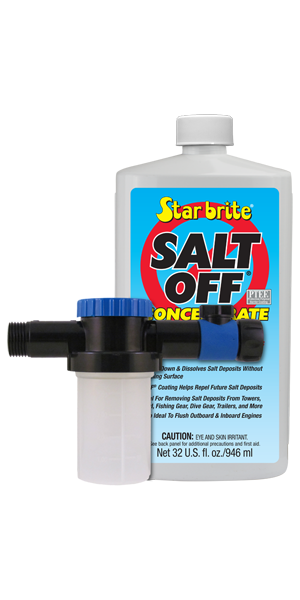 of Salt Off® Concentrate per 1 gallon of fresh water. Immerse item to be treated for several minutes, rinse with fresh water and allow to air dry. To flush inboard and outboard engines: Fill Dispenser Cup with Salt Off® Concentrate. Attach one end of applicator to a garden hose and the other end to a flushing unit designed for your engine type. Ensure black knob on the applicator is in the “On” position and the blue knob is in the “Water Only” position. Run the engine to reach normal operating temperature. Once operating temperature has been reached, turn off the engine and turn the blue knob to “mixture” and verify the solution is flowing. Restart the engine and allow the engine to run until dispenser cup is clear, and the product has been used up. Salt Off®’s coating will protect the engine against future rust and corrosion. NOTE: Do not store Salt Off® in applicator when not in use.